There are 28 reviews of L'Humaniste. Gorgeous herbal fragrance. There is citrus, but it's the juniper, pepper, cardamom, and thyme give it an outdoors quality that is distinct from GIT, but is as evocative. There's a little bit of booziness like in 1270, but less sweet. The juniper is less toasty than what you find in most attempts at the accord. It does fade quickly, but I like the balance of the notes. Nothing is glaring or overpowering, like some oakmoss scents can be. A very transporting experience. Smells fine- certainly nothing unique in my opinion. The biggest issue is the lack of projection- I oversprayed and this still became a skin scent in less than 90 minutes. In 3 hours time, it was completely gone. I expected much more when I shelled out $200 for this. Of the Frapin house, I've only tried Speakeasy previously so the very fresh, aromatic L'Humaniste is really a breath of fresh air. It's a mix of citrus and spice, mainly--a cocktail of bergamot, lemon, pepper, and cardamom. I don't get much evolution into a drydown. Sure, the gin/juniper aspect is there, but very slightly. Overall, L'Humaniste is very much dominated by the opening notes. 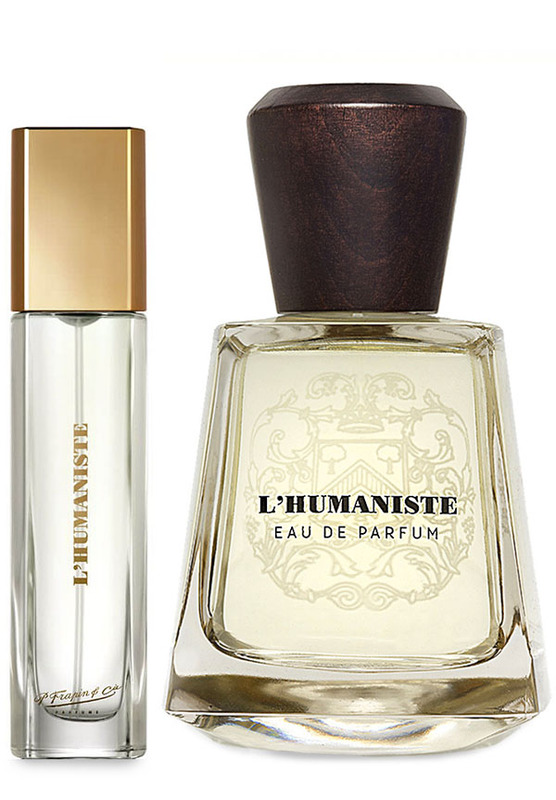 Even at its FragranceNet-discounted price of $115 for 100ml, L'Humaniste is unusually weak for an EDP-concentrated niche-priced fragrance. If the fragrance were, say, half that price, I'd probably buy it without question since it's a very pleasant warm-weather composition that seems to have a variety of uses in the warm weather, wherein performance should not be as much of an issue. I like it a lot but the price is difficult to justify. Starts off with a familiar fresh gin accord that morphs in to a stale white pepper (I get white, not black, as listed in the notes.) The lemon and the peony are at odds with each other and the white pepper just adds a sort of back of the kitchen cupboard odour, old dusty spice rack aura. There’s nothing note worthy about L'Humaniste; It’s pale, placid and possibly, at most, pleasant. Longevity was poor for an EDP, even tragic. After a little time, you just end up smelling like a used bathroom wipe (but far less scented) with a touch of Johnson’s baby powder. I had been quite looking forward to trying this one but ultimately my enthusiasm was in vain. To me, this is dreck. Being number 1 in a series of 16 reviews on critically acclaimed and noteworthy scents. l'Humaniste opens with some very brief citrus and juniper. I get a whiff of pepper - perhaps pink rather than black. For me, this does not approach a gin or mojito accord, as the peony note takes over and turns the whole into a floral. It is good at that point, and for me more redolent of Insense or, in spirit, Richard James. I feel this could be a very good scent on a woman in summer; despite that, it did not feel out of place on my skin. The transitions were seamless. Such a shame, then, that it dies a death at the six- or seven-hour mark without any of the more robust ingredients (aka the base notes, I suppose) making an appearance worth the name. So many times reviewers complain about the longevity of scents, and I laugh to myself, knowing that my skin is of the type to give the frailest of fragrances a chance at a long and happy life. Not on this occasion. I had high hopes for l'Humaniste. It sounded up my street. I cannot countenance, though, paying north of a hundred British pounds for 50ml of something with that performance. The review here is based on my experience, and I understand how many could get on with l'Humaniste, or even love it. What would be my fix (as someone with zero experience of constructing perfumes)? - for a more masculine version, drop the peony, ramp up the oakmoss, possibly add some patchouli. Make the base work harder, keep the wonderful transitions. Comparisons with Dior Allure Edition Blanche, made frequently in video reviews, seem reasonable given my fleeting familiarity with that fragrance. The 'lemon pie' effect is brought about by the marriage of the vestigial citrus and florals (still excellent to the end) with vanilla, although by the time it gets round to this it's time to clock off. I recommend a try to anyone, but I can't help feeling a little disappointed. I wanted to like l'Humaniste so much. Update: just tried Jicky, and thought that had a similar effect to DAEB but higher in quality that either that or l'Humaniste. A sweeter, fresher version of Cartier Declaration, which I don't care for the Cartier, but this isn't bad. Not a must have for me but it's nice and enjoyable. Frapin L'humaniste sample size (5 mL) 0.17 fl oz EDP AUTHENTIC USA SELLER! !